If you have a tree in your yard that either creates too much shade or has succumbed to disease you are probably considering tree removal. However, tree removal is a job best left to the professionals even if you are a skilled and experienced DIYer. It is important to use professionals to remove large trees since it is a job that requires a lot of precision and skill. A lot is involved when it comes to removing a tree from the systematic taking down of the branches to removing the stump. Instead of risking injury and damage to property it is better to leave tree removal to the experts. The following guide will show exactly how much you can expect to pay to have trees removed from your property. It is worth noting that determining the tree removal cost is not an exact science, which means that the information provided here should only be considered as a guideline. Examples of factors that determine the tree removal cost are the complexity of the job and the height of the tree. What Factors Affect The Cost Of Tree Removal? It is far cheaper to remove a tree if it is away from obstacles such as houses and power lines. The tree removal company is likely to charge more if there are risks for damages. The reason why this happens is that their liability increases and they have to be extra cautious, which means using more complex equipment and techniques. The trunk’s diameter determines the tree removal cost. You can expect to pay less for a taller slim tree and more for a shorter, thicker tree. You can expect to pay more if the tree is healthy and robust. If it is dying, dead, or rotting, removing it would be easier and it would cost less. If the price you are offered is not reasonable, ensure that you highlight the fact that the tree is weak. The tree’s height is one of the most critical factors when it comes to the tree removal cost. 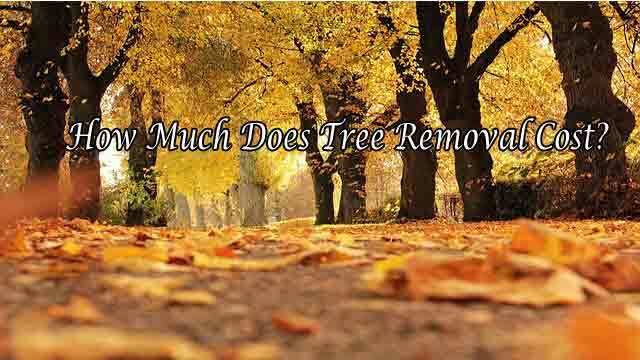 What Are the Average Tree-Removal Costs? If you have a fallen tree on your property, it is important to clear it away without delay. While it is not as risky as removing a healthy tree, it still involves a lot of equipment and can lead to injury if you aren’t careful. It is cheaper to remove a fallen tree than a standing, healthy tree. It costs between $75 and $150 on average. However, the cost will depend on whether it is cut/chopped up or hauled away. If you only want a few branches to be removed because they are interfering with your power line, it is advisable to contact your utility company. The issue should be fixed for free. If you want the branches removed for a different reason, you should get a tree service to remove them. You can do it yourself if the branches are small. If you have to hire a tree service professional, expect to be charged an hourly fee. Companies typically charge between $200 and $300 per hour. The reality is that there’s no realistic way to remove large trees from your property. It is a job that you don’t want to do yourself. It is also worth noting that it can be quite expensive. The total costs will depend on several factors. If workers have to climb up high and rope down many pieces before they fell the tree, you can expect a handsome bill. You may find yourself paying over $1,500 for that services. While some companies throw in extra services for free, many don’t. Pine is of various types, but the average height is usually between 40 and 60 feet even though some varieties reach 80 feet. The total amount you spend to have a pine tree removed from your property will depend on the size of the tree. You may find yourself paying $200 for a small-sized pine and over $1,500 for a more extensive, taller pine. This is why you need to get several quotes for the job. Oak has a reputation for being very tough and strong wood. Oak tree removal is typically charged a premium to remove it. Oak trees are also incredibly tall. The average height is 60 feet. If you want it removed, you can expect to pay between $200 and $1,000. Since it is a solid, thick wood, the cost is likely to be towards the higher end. It is essential to ensure that you have a good reason to have your oak tree removed before you spend too much money. Having a tree safely removed by a professional may seem like a significant expense, but it is well worth the money. If you allow professionals to handle it for you, you can avoid any serious injuries to yourself and damage to property. Removing a tree is probably not an easy job and should be left to the professionals. The prices provided here are just a guide, so, if you want actual costs, you should get quotes from reputable tree removal company.